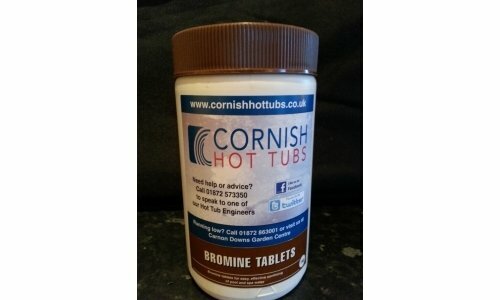 Spa Bromine Tablets are a popular alternative to chlorine sanitisers. Dosed via a floating dispenser, these slow eroding tablets help maintain the recommended bromine level of 3 -5 mg/l (ppm) over a period of a number of days keeping your spa water safe, sparkling and bacteria free. Bromine is softer than chlorine & causes little or no eye, skin and nasal irritation. Also there is not the pungent smell often associated with certain types of chlorine treated spas. Bromine retains better levels of efficiency over a wider pH band than chlorine, which makes it ideal for spas as the pH can fluctuate rather rapidly during heavy bather loads such as parties. Provided the water is balanced, bromine levels of between 3.0 to 5.0mg/l (ppm) are sufficient to maintain healthy, clean water. – ALWAYS USE A CLEAN DISPENSER/FEEDER AS BELOW WITH NO OTHER PRODUCTS PRESENT. 1.These tablets are designed for use with bromine feeders and floating dispensers. 2.When feeder device requires refilling with tablets always follow manufacturers instructions. 3.Ensure tablets used in the feeder are of the same chemical (Bromo-Chloro-Dimethyl Hydantoin). If other materials have been used previously, wash out feeder thoroughly before adding tablets. 4.Adjust feeder to ensure a constant bromine residual is present in the spa. 5.Check bromine levels regularly with a Test Kit and maintain a bromine residual of 3 – 5 mg/l (ppm). 6.Check pH value regularly with a Test Kit and maintain levels between 7.2 - 7.6.